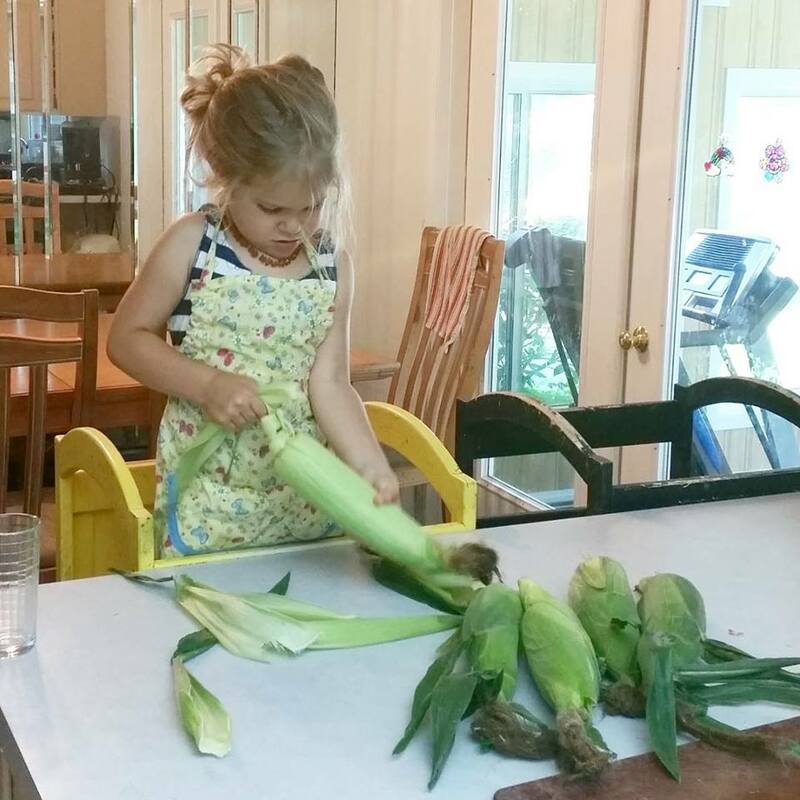 “Raising a real food generation in the real world” starts with getting little ones in the kitchen! 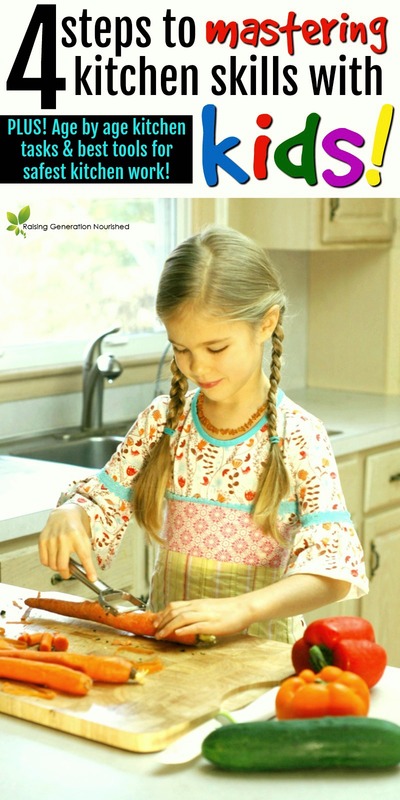 Learn the 4 steps to mastering safe kitchen skills with kids age by age! This post is so full circle for me. I literally have chills as I write these first few sentences, because other than writing about nourishing babies with real food and stopping the cycle of processed food, this topic is what I had envisioned writing about more as my kids get older. Because this is where it all begins, yes? 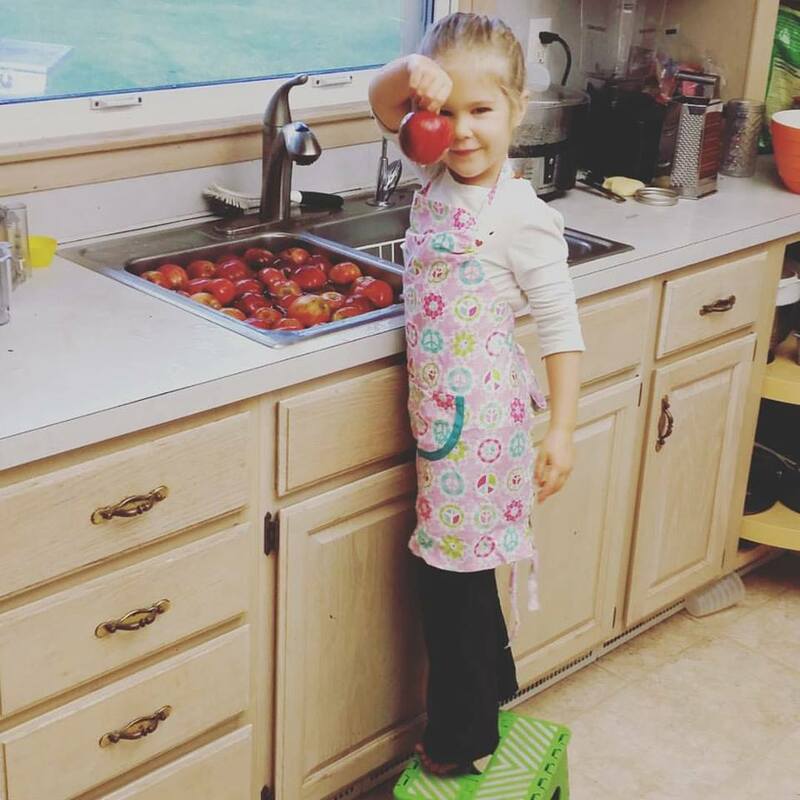 If we want to see the next generation of kids know where their food comes from, and “raise a real food generation in the real world,” it must start with the littles in the kitchen. 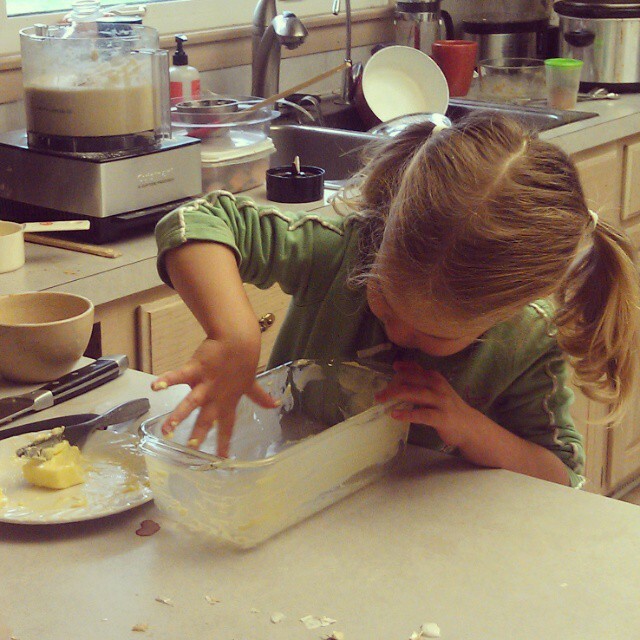 …We must stop the cycle of disconnect with our food, and be ok with messy hands, spilled milk, and egg shells in the batter. …We have to be ok with dinner prep taking a few minutes longer so the toddler can be the one to wash up the potatoes, and 9 year old can be the one to do the chopping. 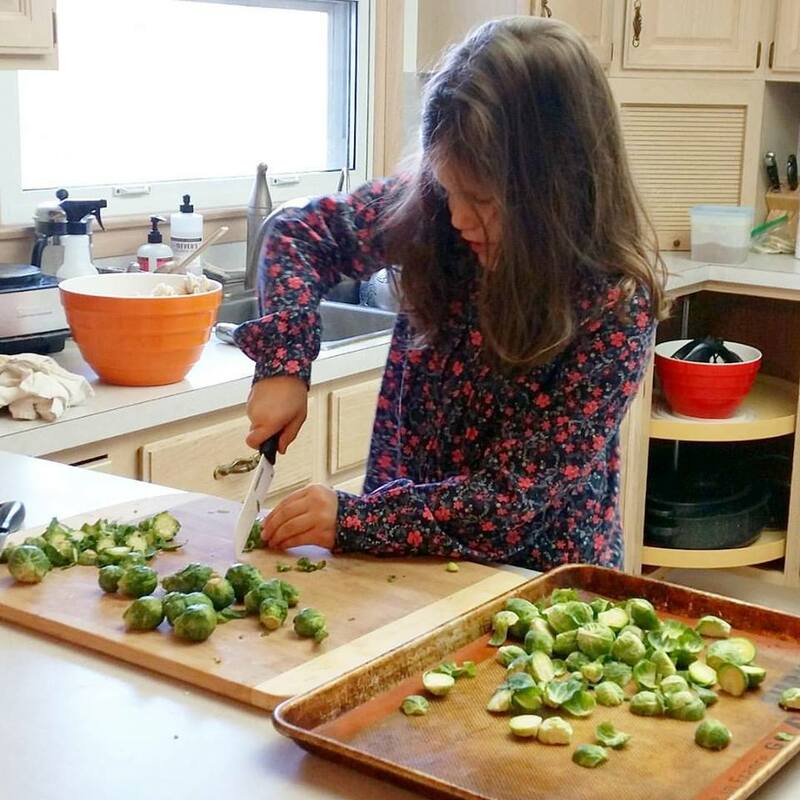 Maybe not every night, but making a commitment to include our kids in the kitchen will save them the years and years of relationship issues with food that the last few generations are still digging out from. So here I am, 8 1/2 years after having my first baby, and having ZERO culinary background or schooling, to tell you that kids really can learn how to master kitchen skills. I’ve found that even with my 3 very different personality kids that there is a really concrete flow for teaching them how to master these skills without tears or frustration. Here is my method! These steps are evergreen for any kitchen skill at any age. The process will look a little different between showing a 3 year old a new skill versus a 10 year old, but the concept is the same. The goal is to set the kids up to succeed and not fail. Show Them. YOU do the task and explain what you are doing along the way. SLOW DOWN, so they can see what you are doing and process it. You may stay at this step for 1 run through, or for ages. For instance, washing up produce really just takes showing your 2 year old how you want the apples washed, how to do it with care so they don’t bruise, and where to set them when they are done washing. How to clean up their splashes and how to dry the apples. Easy peasy. But my toddlers watched me most of their toddler-hood before they used a sharp knife. Anytime they were up in their little helper stander watching me chop, I was telling them what I was doing. It all starts there. Hand Over Hand. Get right up over their shoulders and help. Even with the washing example, a 2 year old will still need help along the way until they have done it a few times and know what to expect. You can hand over hand peeling carrots, chopping fruit, stirring a pot of soup or muffin batter, etc. This is really key to helping kids feel confident – because you can keep them safe at the same time. Slip ups and mistakes will still happen, but you are still there. Supervised Independence. This is where the setting them up to to succeed comes in. Stick around until they feel confident on their own. Letting a 2 year old go to town on a sink full of produce will only end in a mess to clean up and an irritated mom if you are not right there next to them in the beginning to let them know it is not ok to pour a cup of water on the floor. When expectations are clear, they are set up to succeed. This step also is important with older children as well. 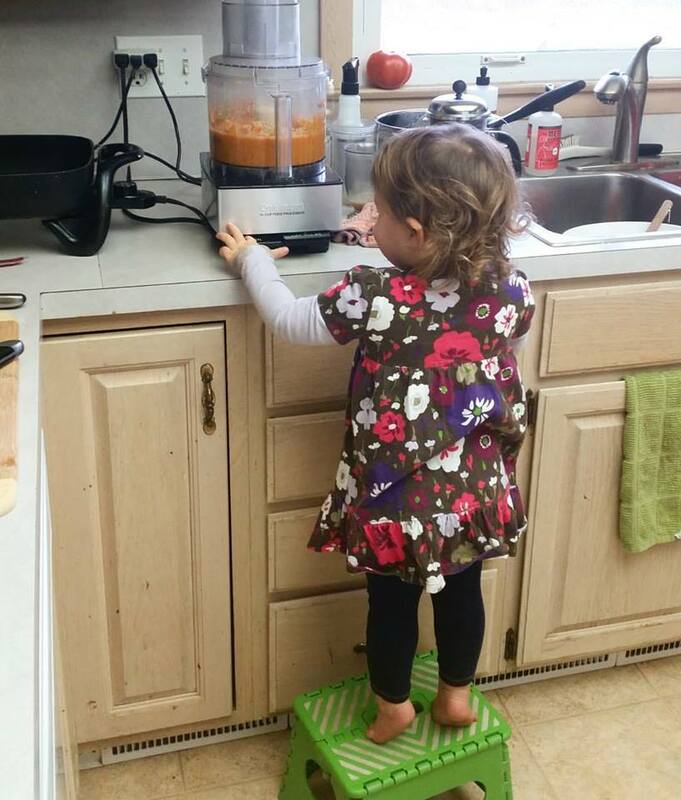 My 8 1/2 year old is still not out of this step for chopping with a sharp chef’s knife. 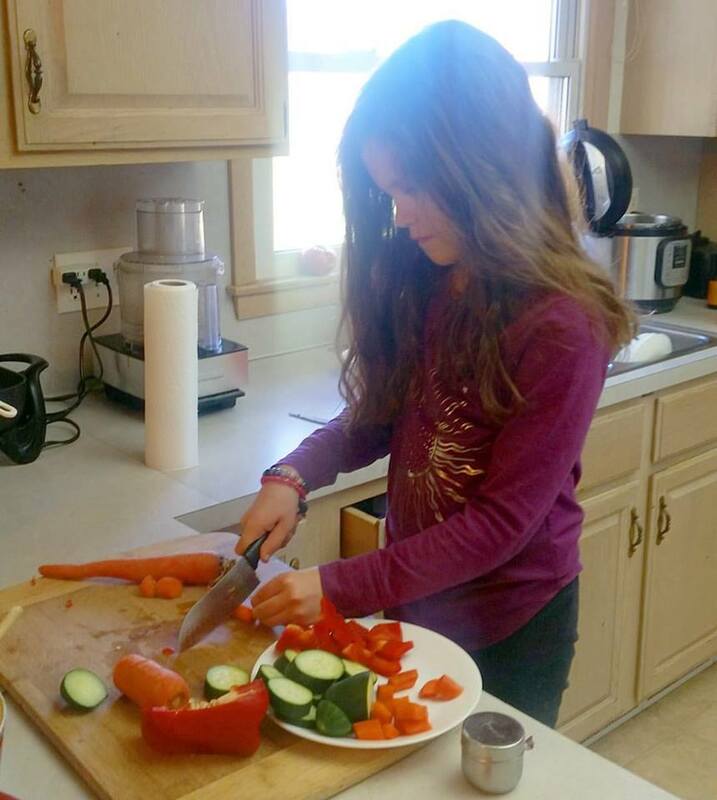 She mastered using a kid safe kitchen knife years ago, but last year we introduced a kid hand sized, regular sharp knife, and I’m still watching over her shoulder here and there as she goes along. It gives me a chance to correct a posture or holding technique so she doesn’t get hurt. Mastery. When the child has demonstrated independence over a period of time, you can confidently let the know they have mastered that skill. 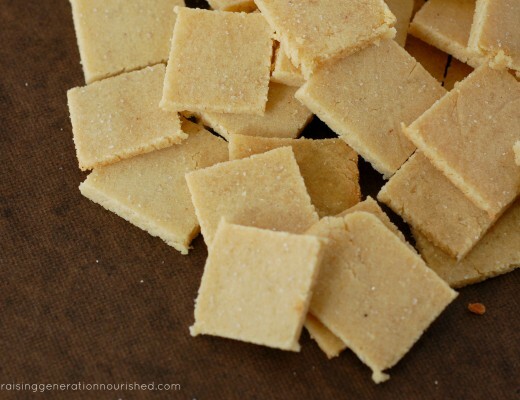 Kids love this – they literally eat this kind of challenge up. 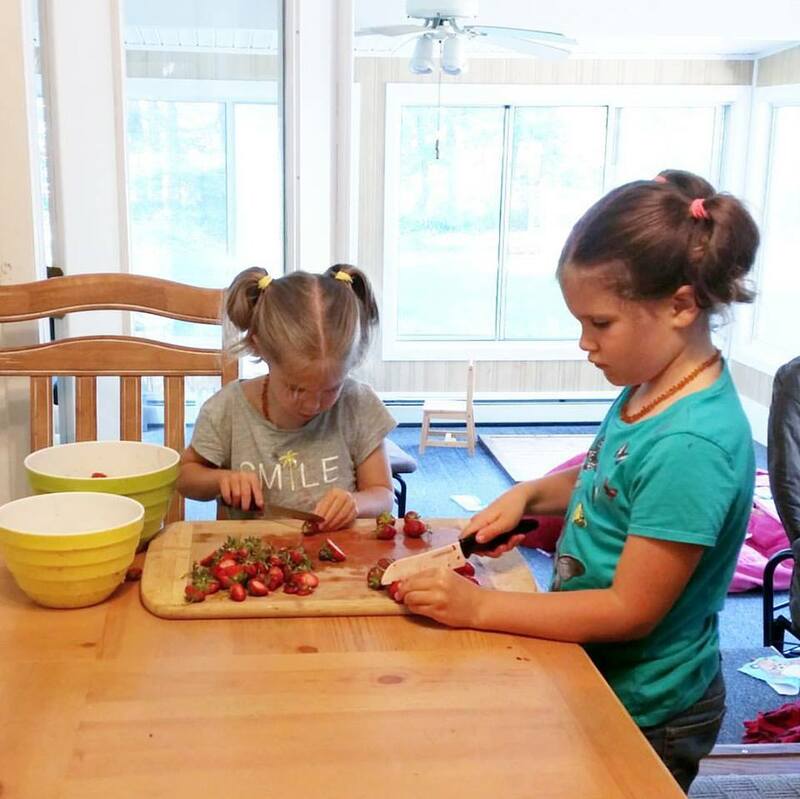 I learned this terminology from watching my girls in their Montessori school – mastering certain skills or work stations gave them such pride. So let’s talk about age appropriate tasks! Here me on this first, and repeat after me…every kid is different. EVERY kid is different! This is not concrete, rather a general guideline. I remember thinking sometimes, there is no way my kid could do this or that, and then got gutsy and tried it, and they blew me away at their ability. Other times I would try something that one of the other children was responsible to do at a certain age, or caught onto fast, and was quickly reminded that not every kid is ready for everything at the same time! 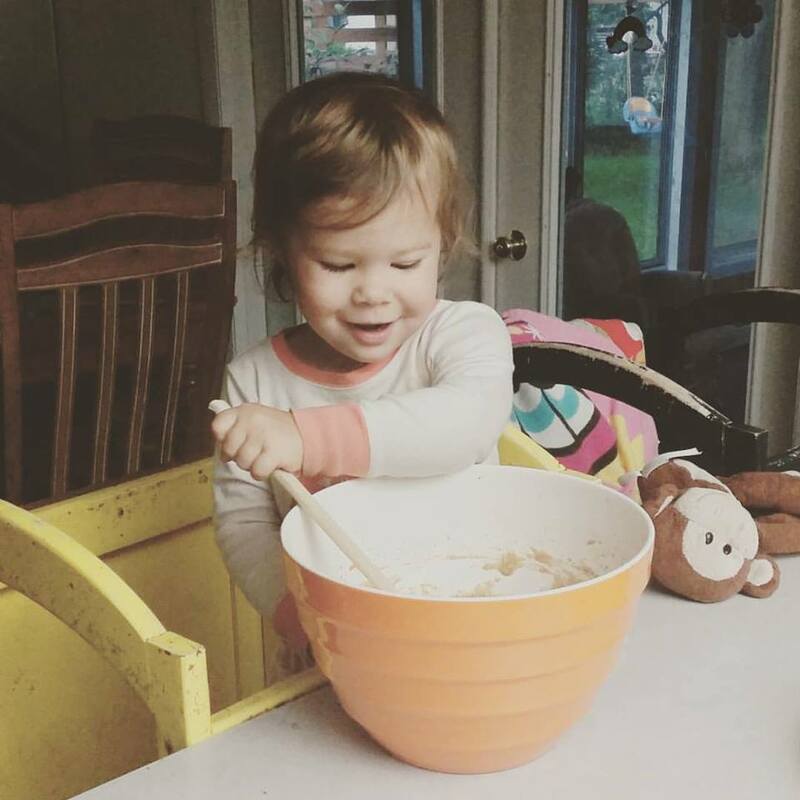 “I Chop, You Dump!” :: Toddlers love putting things in and out of bowls, filling up cups, and just feeling like they are helping momma. Tell them you need some help getting those chopped veggies in a bowl and they will proudly puff their chests out to be the big helper. I’m telling you, give a toddler a board full of chopped carrot coins and they’ll put them from bowl to bowl or cup to cup for a good half hour of focused play! I used to start dinner early just for this great occupying play! 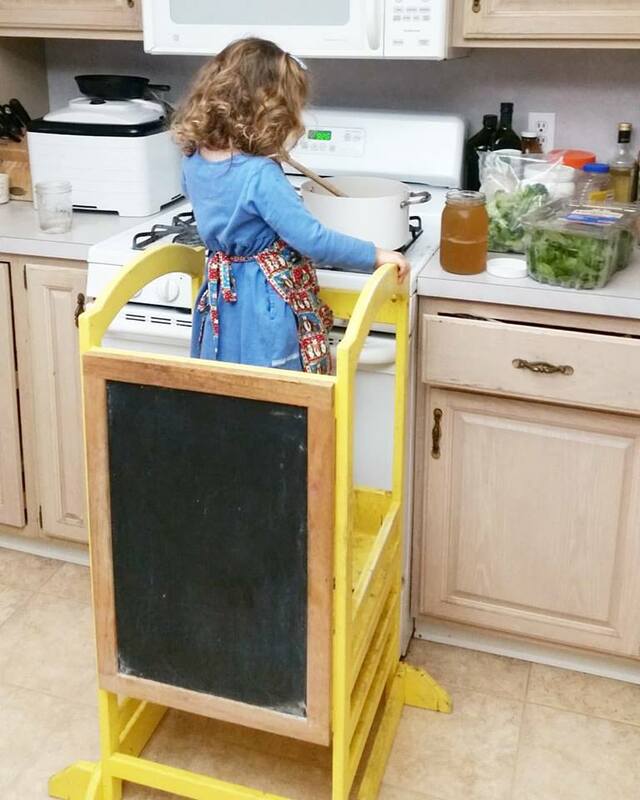 Washing Produce :: Hop those toddlers up on a Little Helper Stander and let them help scrub the potatoes up, wash up the apples, and rinse of whatever produce you are preparing. A bowl full of water and chopped leeks are great sensory play to get the sand out (and they will inhale this creamy potato leek soup after they rinse the leeks!). Pre-Chopping Skills :: We purchased this toddler chopping toy for my oldest’s 1st birthday, and it has been passed down to each of the other girls – it is a GREAT way to introduce the process of chopping to little ones in a safe way and start building and coordinating their hand muscles for this task. Other odds and ends :: Toddlers big puffy heart love buttons! Let them push the blender, mixer, or food processor on! They also just love being a part of whatever you are doing. 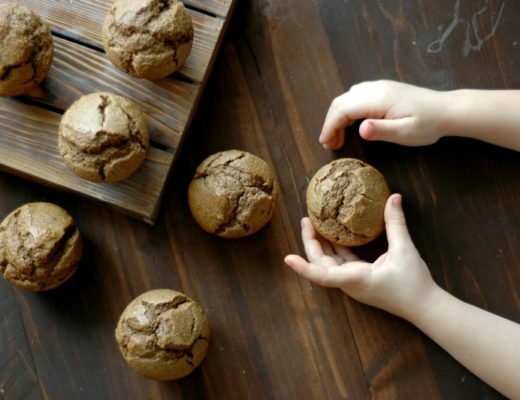 Take the time to let them take a turn to stir the muffin batter, put the muffin cups in the muffin tin, put the veggie peel scraps in the garbage, hand over hand scoop the biscuits off the baking sheet, and butter the pan for the bread. You’ll be surprised not only at how much they really can do, but what this does to puff up their confidence in other life tasks. Not only will these little guys transitioning into more preschool ages still thoroughly enjoy the tasks from their babyhood, ages 3-5 is a fun age because they are gaining more fine motor control and can reason about hot/cold, cause and effect of splashing, and some are even trustworthy to start some simple knife skills. Same Kitchen Tasks from the Above Babyhood Section :: Just take it up a notch. Give them more responsibility such as counting out how many potatoes need to be washed and dried – and clean up the splashes that happen. Let them mix a bit more when you are making muffin batter. Peeling :: One of my girls was peeling with a Y-Peeler by the age of 2, but she was extremely trustworthy and followed directions well. I usually like to start peelers around age 3, but again, follow your child’s lead. Follow the “4 Steps to Mastering a Kitchen Skill” from above, and you’ll probably never have to peel a carrot as long as they are around! 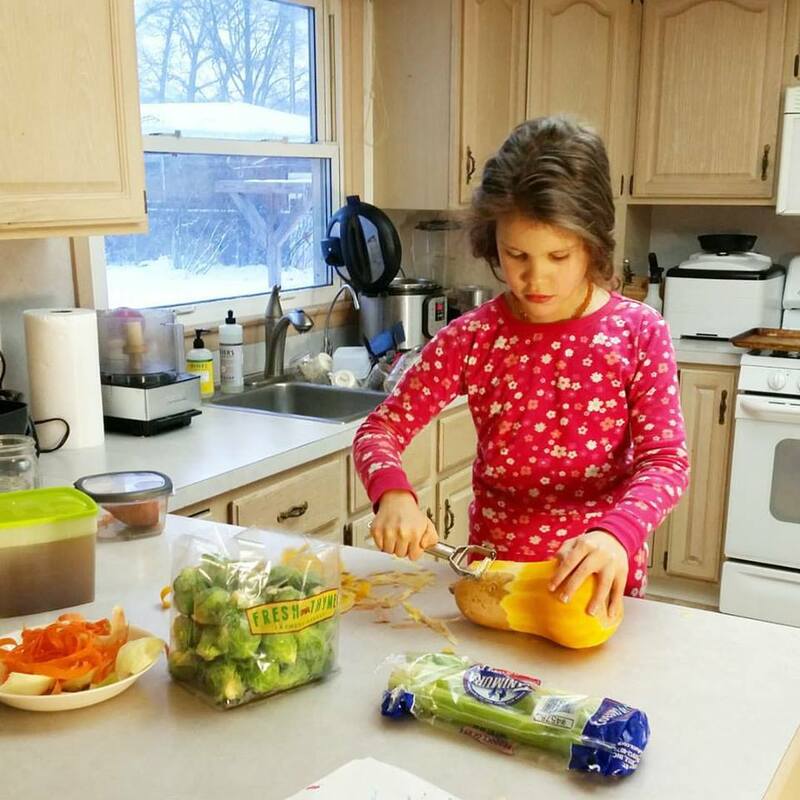 Your older 4 and 5 year olds will also enjoy the Julienne Peeler to make strips of veggie “noodles” for stir frys – they are always a big hit here! 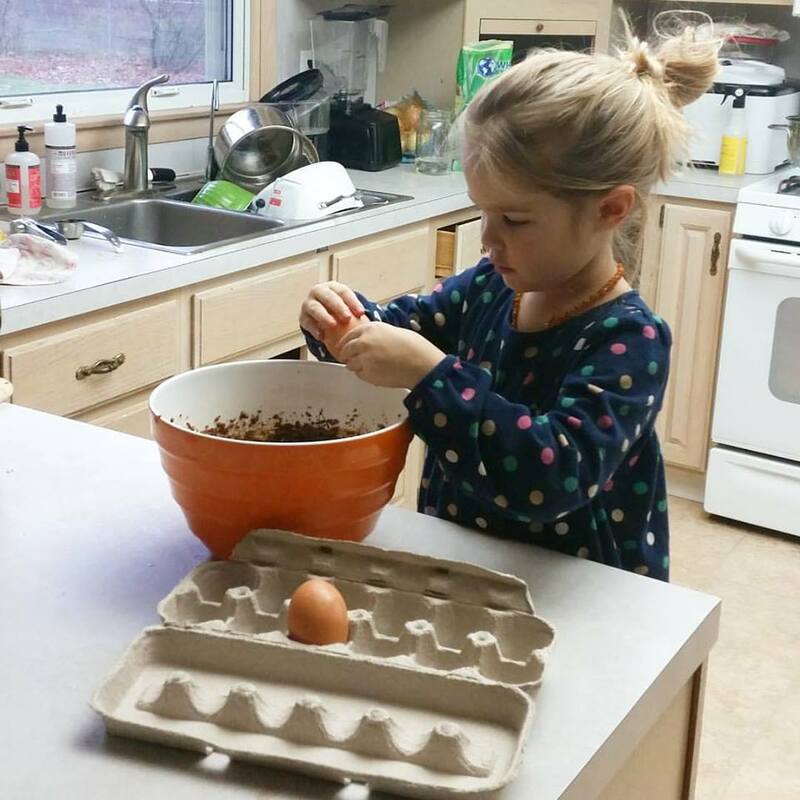 Cracking Eggs :: This is a good age to start this skill, though my experience has shown me every kid picks it up differently – one of mine took a good year to master this skill while another just a few tries. Just follow the “4 Steps To Mastering A Kitchen Skill” from above and they’ll catch on! Measuring :: I typically start introducing this skill around this age by measuring it myself and letting them dump into the bowl. 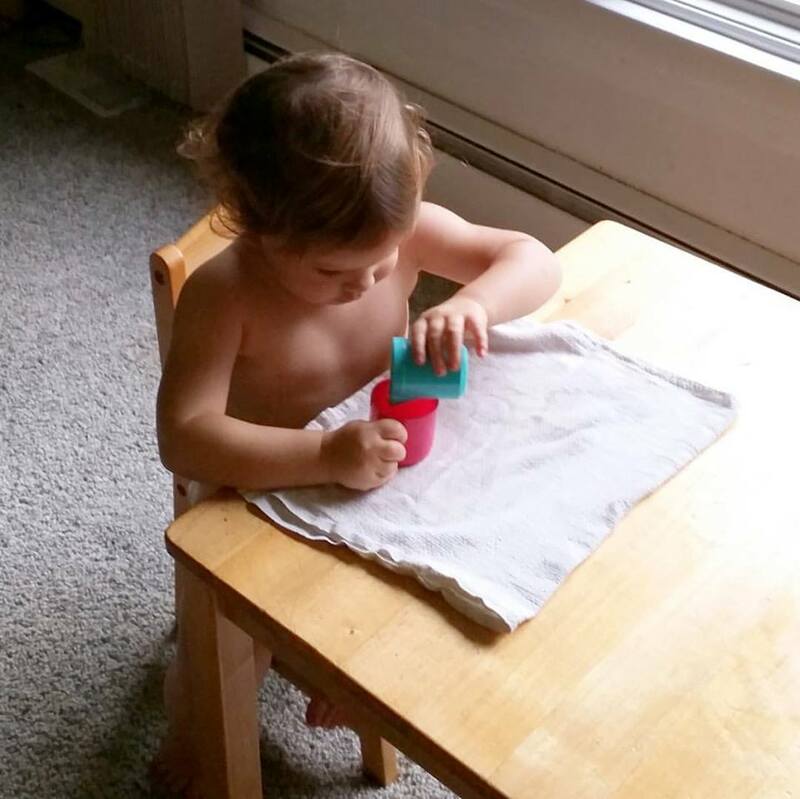 As they get closer to age 4 and 5, you can start with some independent measuring using smaller measuring spoons and work up to the bigger cups and liquids. Pouring :: Don’t start with something you need poured precisely right away. Start with just a couple of simple tea cups or small pitchers with water only a quart of the way filled up and let them practice pouring from one pitcher to another. Back and forth. You can even start with something dry like rice or beans, and when they master pouring that, use a little bit of water. Special Tools This Age Can Manipulate :: This age does well peelers, Julienne peelers, spirilizers, and little choppers for dicing onion or chopping nuts. Apple cutters work well if you get them started. Don’t try a full apple until they are a bit older – cut some rings of apple and let them do the rounds versus a full apple – full soft pears work well though! 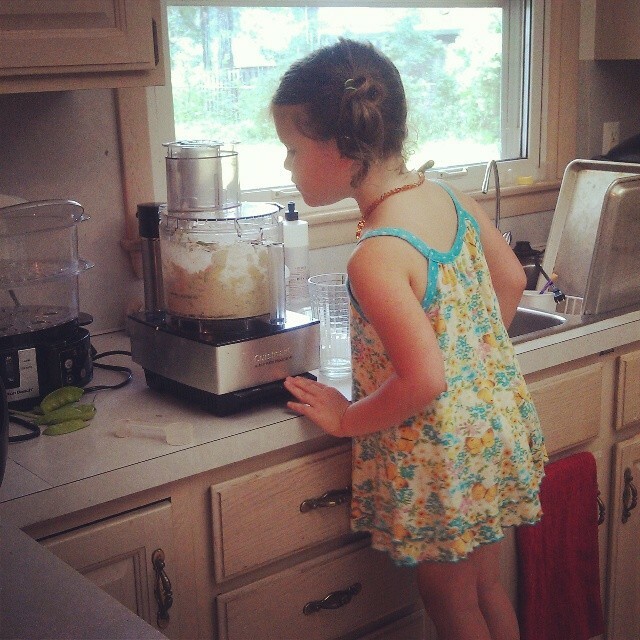 They also still love pushing buttons, so let them make the hummus in the food processor, or blend up the smoothie. 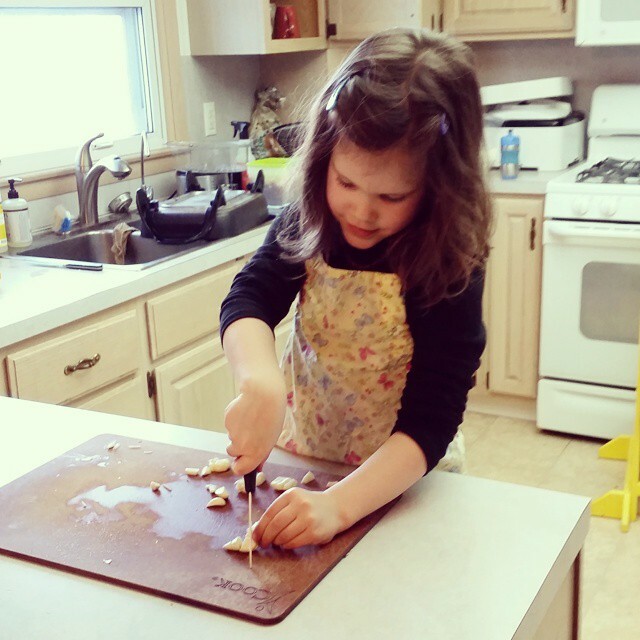 Pre-Chopping Skills :: At this preschooler age, I like to introduce a these kid safe knives and start hand over hand chopping practice with soft things like steamed veggies, bananas, strawberries, or soft pears. 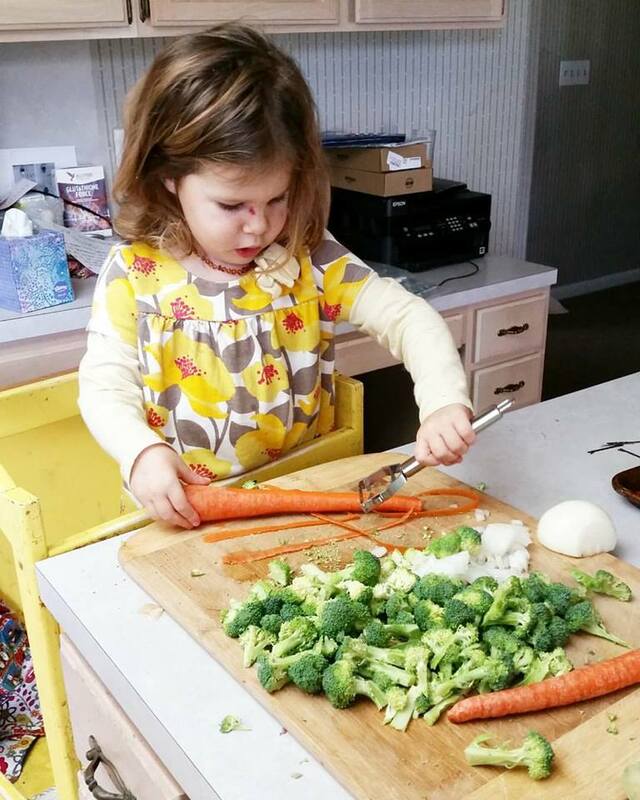 You will definitely find that chopping responsibility age varies from kid to kid. My first born was trustworthy with a small, paring knife (paring knifes are sharp) for strawberries and other soft veg around the age of 4, while my other 2 were not. My 6 ½ year old is just now starting to use a sharp knife (this chef’s knife is my favorite knife for older kids as they start needing sharper knives for real chopping) safely and I think this is probably more the norm. 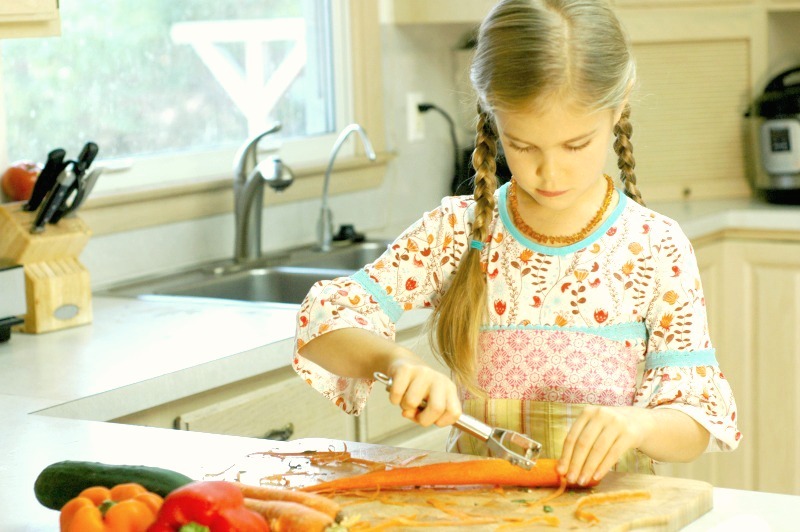 Hot Food Prep :: Just like knife skills, trustworthy-ness for hot food prep will vary in age from kid to kid. My first born was standing next to me in her Little Helper Stander at the age of 2 and 3 helping me stir a pot of soup. Never leaving her side, but she was very trustworthy. I learned real quick that my second born was not the same way from the second I set her up there and she was going to test my warnings of “hot” herself. 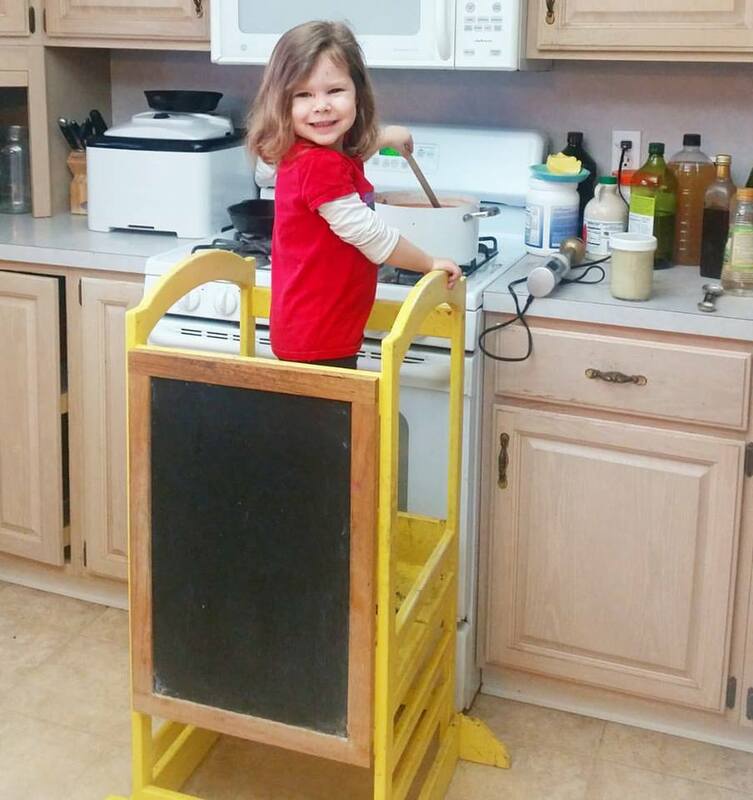 Simply let them know you are going to scoot their stander over to the other side of the counter where they can stir a bowl of pretend soup (water) until they are ready to be safe with hot food. It isn’t a big deal! They’ll catch on! She was safely stirring a pot of soup closer to 4 ½ and this is the same for my third born. Refinement of Toddler Section Skills :: Now is when I’m going to start telling you to let go a little 🙂 Let them make a mess a bit while they learn how to measure flour precisely, let them get a little egg shell in the batter as they refine their egg cracking skills (just scoop it out before you mix! ), and let them have a salad with roughly chopped versus neatly diced carrots. Their confidence and skill mastery will only sharpen with letting go! 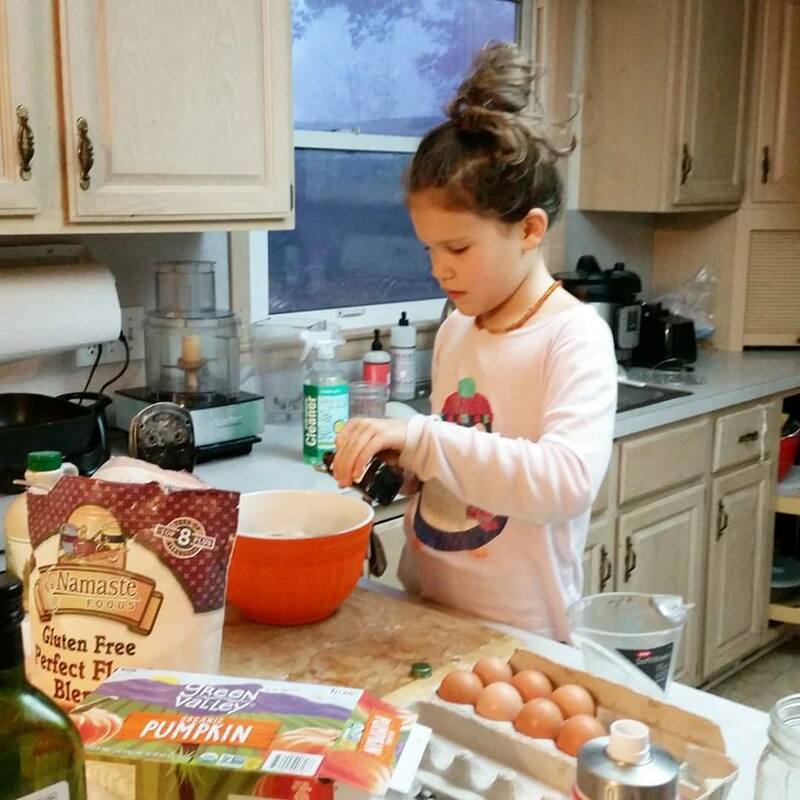 Follow a Recipe :: While my toddlers and preschoolers watch me refer to my recipes while cooking all the time, when my Kinder age kiddos start reading, I start pointing out what I’m reading and why. 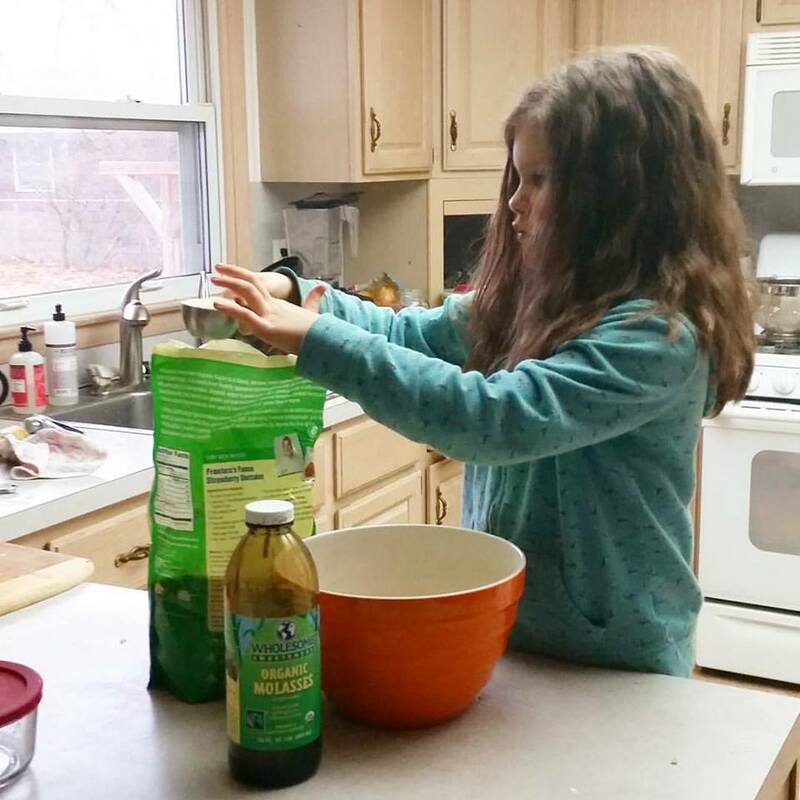 Let the 8 and 9 year olds follow a simple recipe for making hummus, a salad dressing, or simple soup. Measuring and Pouring :: Let it go momma, and let them try 🙂 Put the flour in an easy to scoop container (I actually find freezer bags are just as good for the little bags of gluten free flour). Instead of pouring milk from a large jug, let them measure it out from a smaller pitcher. Yes, more dishes to clean and a little extra time, but it is worth it every so often to let them practice this skill. Blending, Mixing, Whisking, Folding :: Follow the “4 Steps to Mastering a Kitchen Skills” and show them the difference between stirring and folding. Show them the different tools and the why behind wanting to fold something versus blend it up with a mixer. Hot Food Prep :: This age should be pretty good to go on helping stir a pot of soup, but this is also a great age to start teaching how to make a simple egg in a pan, flip a pancake, and sear some meat. It takes some time to supervise and help them learn the coordination of it all, but it is worth it when they can fix themselves an egg in the morning without your help! 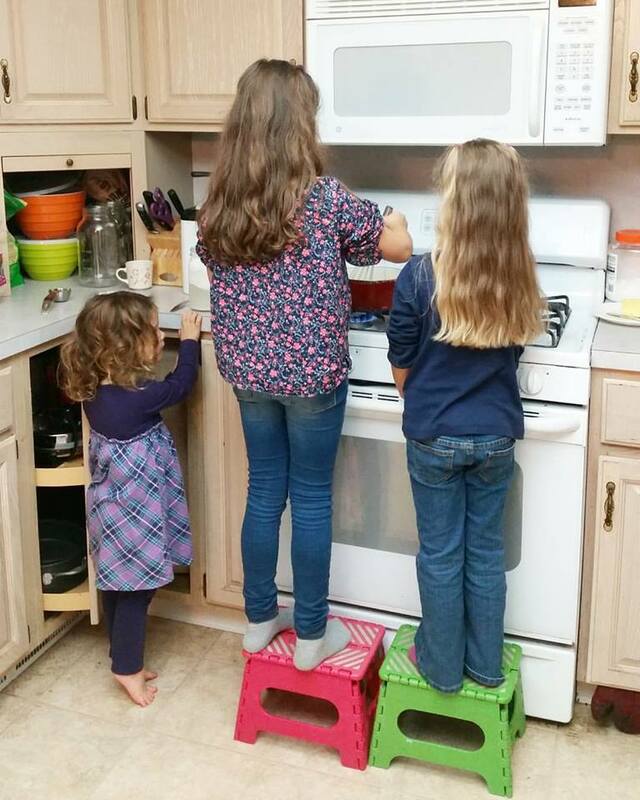 Again, I think it is best to keep them up and over the work area, so even my 8 year old still uses a step stool at the stove for safe hot food prep. 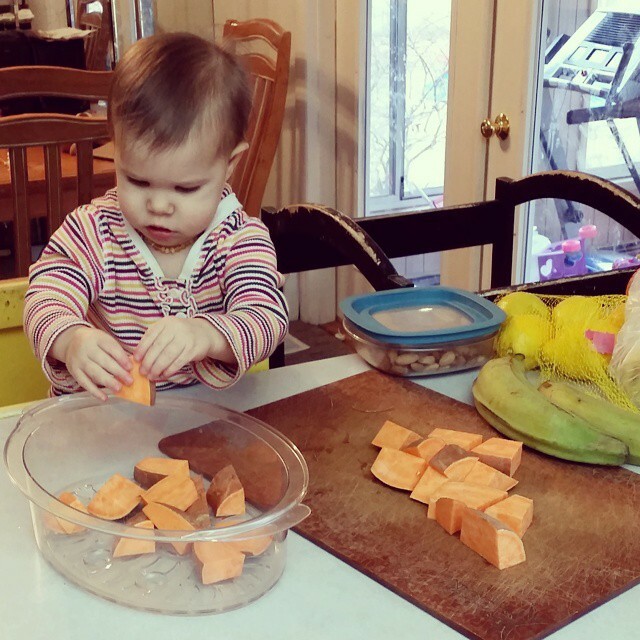 Pre-Meal Planning :: This is a good age to start testing all that you have taught them as little ones with regards to eating in a balanced way! Start having them help you plan out the breakfast menu, pack a balanced lunchbox, and prepare dinner. Every family’s eating style will be different even within this RGN real food community, so I won’t tell you what that should look like. As an example in our home, there is always a healthy fat, veggie, and protein at each meal. It will look differently from household to household, but my kiddos by this age know how to plan a meal and what might be missing. So here’s were I’m going to make this post an ongoing work in progress! My oldest is 8 1/2! I don’t have older children yet, so I’m not going to pretend that I know what I’m doing here. I do have a few thoughts that I will share, but as my kids reach through these ages, I’m hopeful to update this section as we go! I think these older kiddos, just like our little guys, are capable of much more than we think. 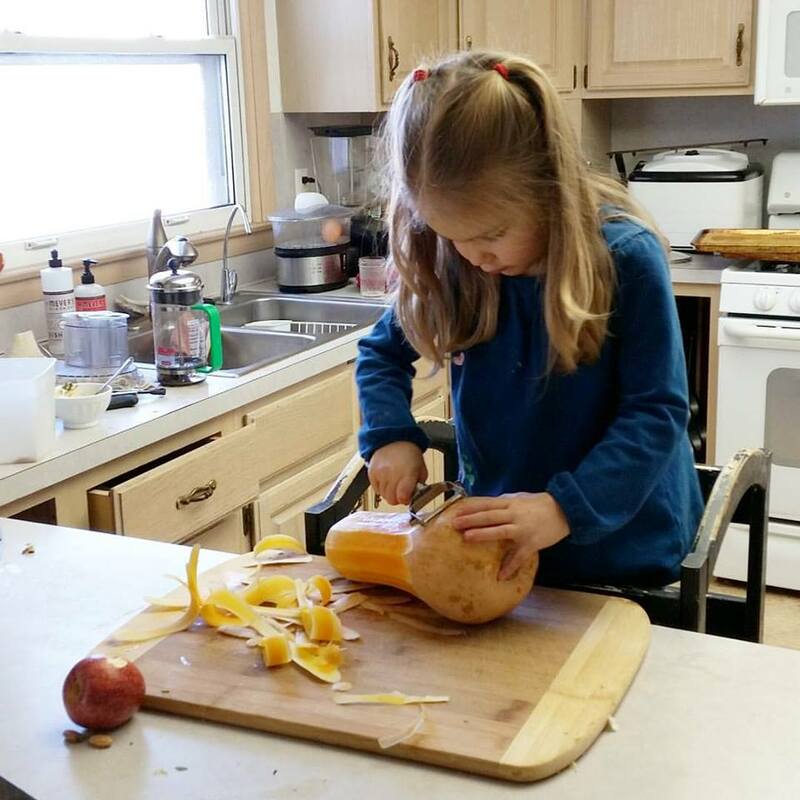 I’m just now starting to work with my 8 1/2 year old on more refined cubing of potatoes and dicing of veg for soups. Following bigger recipes and taking things in and out of the oven. I think tweens and teens ought probably be helping plan and make most of one meal once or twice a week, and packing most or all of their lunchboxes. 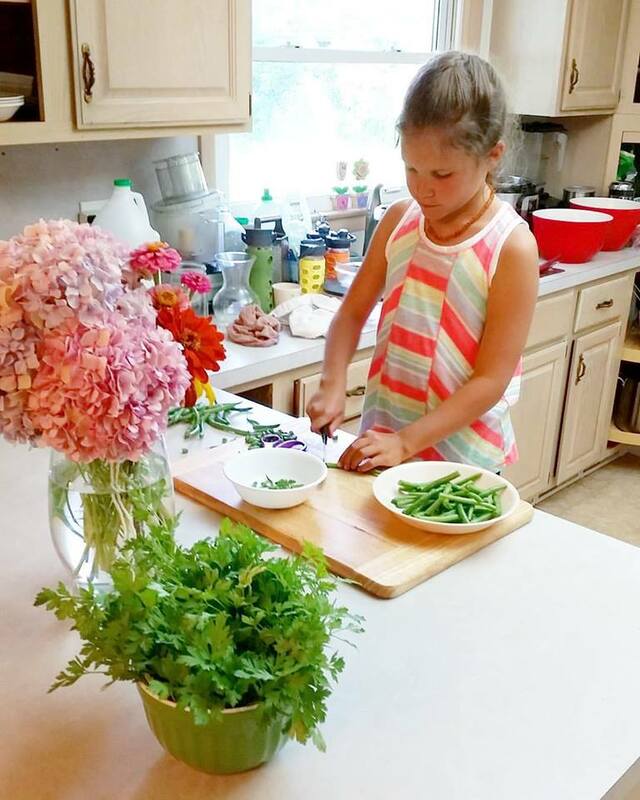 I would really love to hear what your tweens and teens are doing in the kitchen at home! Inspire us with little ones by using the comment section below to tell us all that your teens can do! Here is a comprehensive list of the tools I love using with my kids – I have tried and tested SO many different kitchen tools with them. 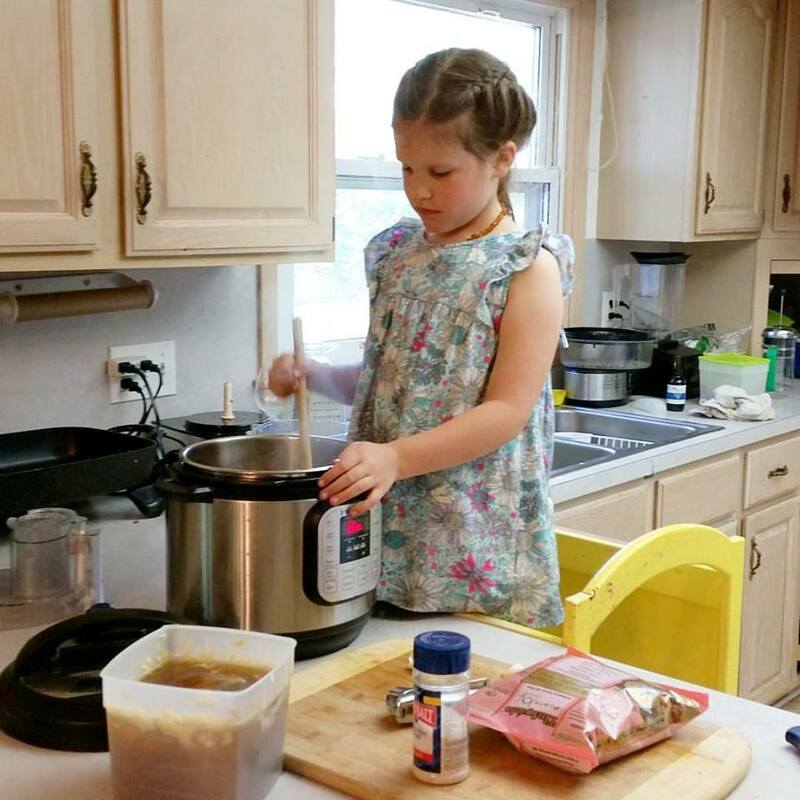 Some have been disasters, and so this list is truly all of my favorite tools to make working with my kids in the kitchen safe, easy, and fun! One of the tricks I used to adding to my kitchen tool collection for the girls, was getting these tools on their gift lists for holidays, birthdays, etc. Wrap them up in a fun apron, or slide a great recipe in with the gift with the promise of some kitchen time together! 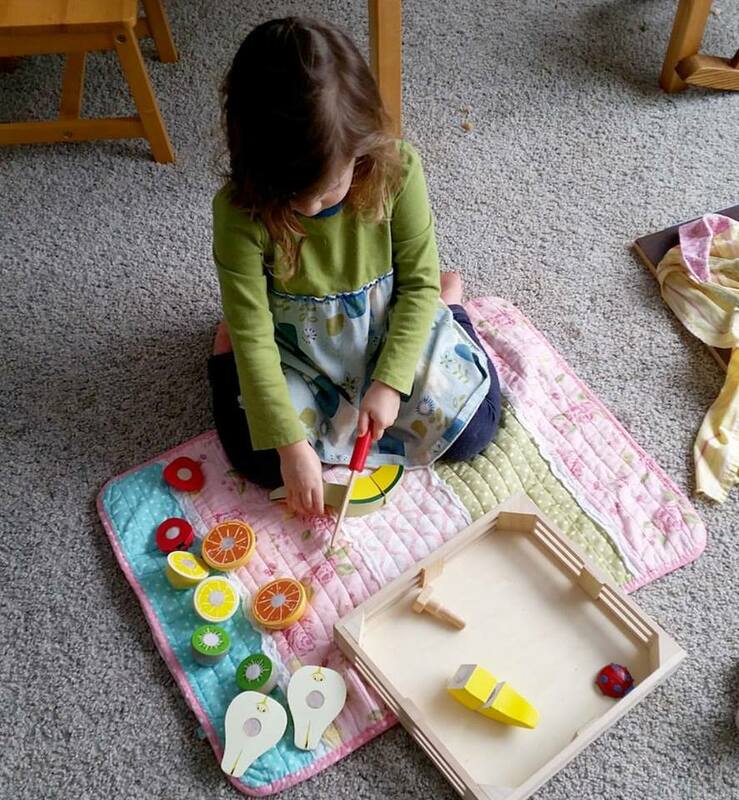 Cutting Boards – As far as cutting boards go, I find my heavy bamboo cutting boards work well for kids because they hold still. Though, I thought this looked like a good deal with the kid safe knives that came with the non slip grip cutting mats! Crinkle cut hand chopper – this is a GREAT one for littles because their fingers are out of the way and it’s easy to use! Eggs- We separate a lot of eggs, mostly for waffle morning, and I find this egg separator makes for less mess and accidents when dealing with kids and this task! Also, while it is totally do-able to cut hard boiled eggs with a knife, I’ve found my kids adore this egg cutter, and it’s the only way my youngest will eat one! Cherry Pitter – since we live in Michigan, we have been through every cherry pitter known to man, and I thought I’d share with you our fav! We have found this one is best for little hands, although one of these is super nice too! I love these hand scrubbers for your littles that want to scrub up produce! 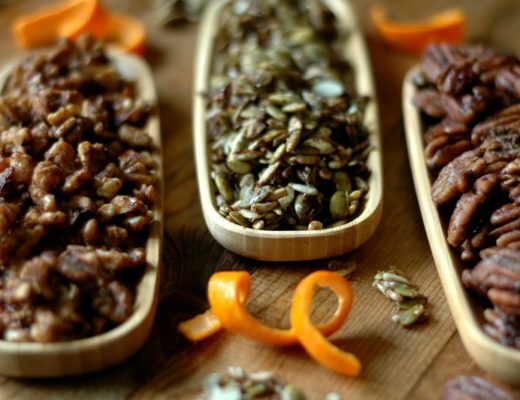 How To Make Sprouted Candied Nuts & Seeds :: Sprouted For Better Digestion & Nourishment :: Made With Real Food Sweeteners & No Junk! Yes, yes, yes! I adore this post and everything in it, especially all those beautiful photos of your little girlies! 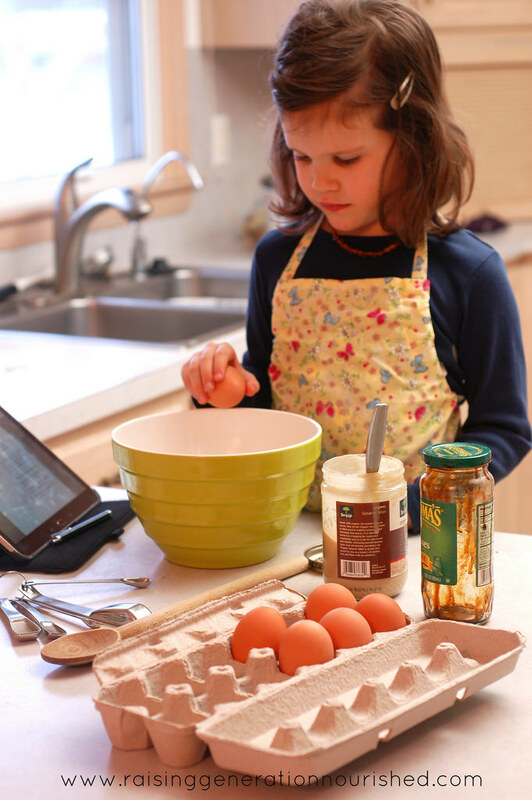 It is SO important to get our kids into the kitchen! I love how you’ve broken it down into doable, practical tips! Wow Renee this is wonderful!!! Tiny Love is sitting here looking at all of these photos with me and she’s saying “I can do that!” or “I want to do that!” Thanks for the reminders about some of these, you know I get them in the kitchen with me, but I tend to forget how much they can do. 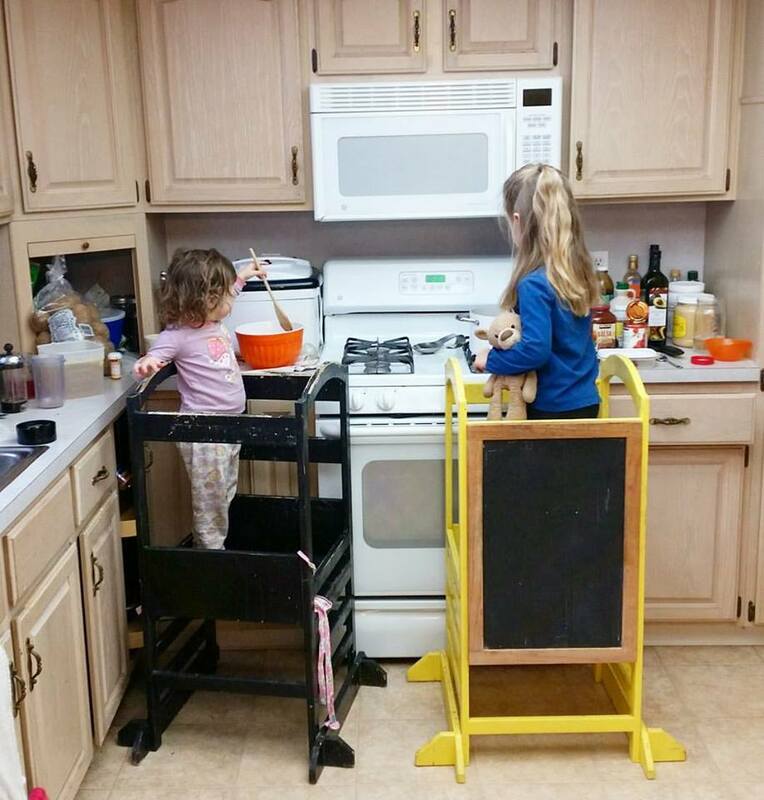 I know I can give them some more tasks and especially with my oldest, I need to give her some more independence in the kitchen. Also, I’m getting those knives! Awww sweet girl! I love that! Enjoy those knives! These are great! Pics are so cute as well! 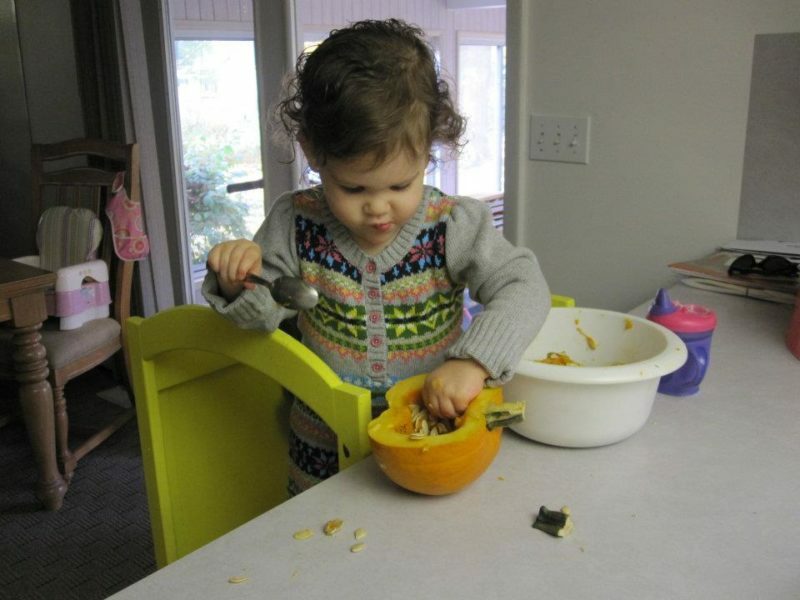 Renee, I love all those dated photos of your girls, doing their important tasks so early, like scooping seeds from the squash! How helpful to have the tasks separated by what’s age appropriate! I remember when my oldest was little I was uptight and wanted to prevent a mess, lol; I think I was sleep deprived. 🙂 Now I LOVE having them all help, and especially my oldest who’s 16 and just made our dinner last night, and my youngest who makes his own banana cookies. Such a sweet process and reward. I love the real-ness of this reply Megan 🙂 Because there were times I did shoo them out of the kitchen because I just couldn’t bare another mess to clean! We are real people, right?! I am so inspired by your teens helping so much – I can’t wait! I love this post! It’s so important to teach them how to cook at a young age. 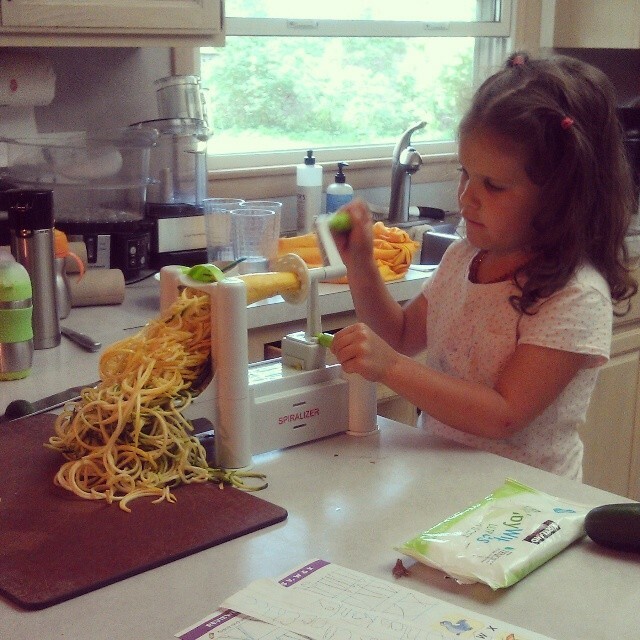 This is such an awesome post, and I think it’s so great when kids learn how to make healthy food! I appreciate your kind words Monique! This post is amazing! As a newer mama I appreciate all of the tips and inspiration! So many great tips! 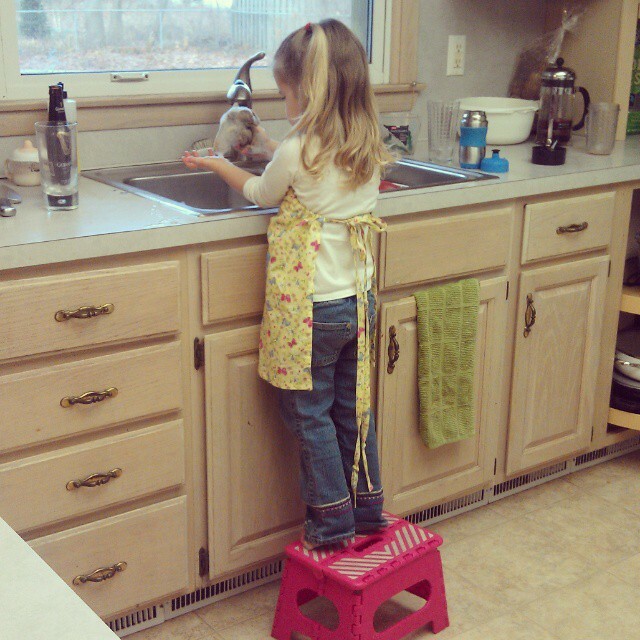 It’s so important to get little ones in the kitchen. I can’t wait to start cooking with my niece! She will love that Corrine! These are such lovely pictures! I agree, it really is an excellent education! 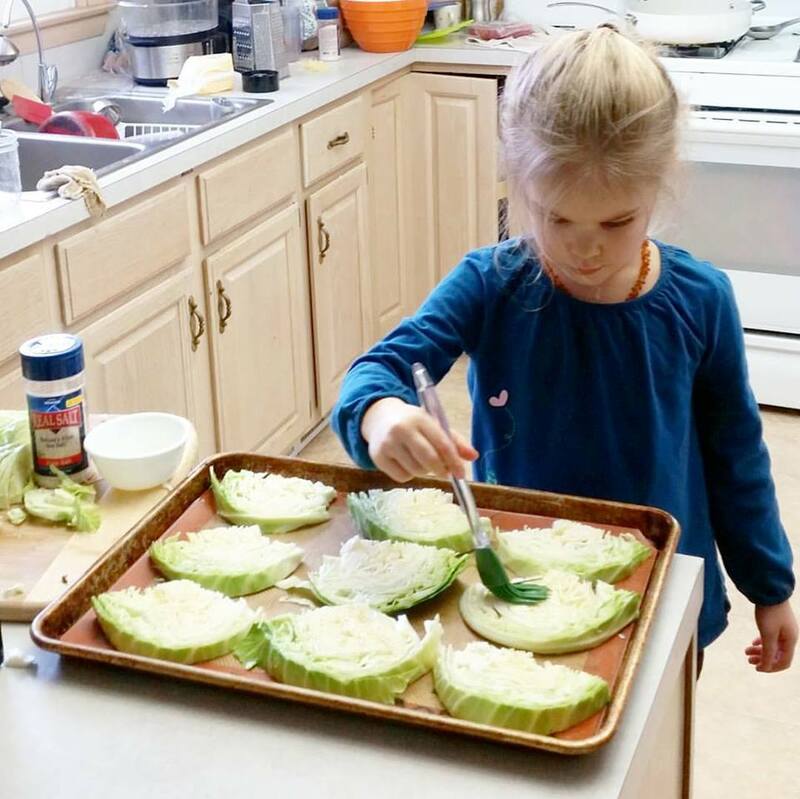 My kids get a real kick out of helping in the kitchen, and I can usually get the fussy eaters to try new things simply by getting them to help make it! Yes, Nicole, that is a great perk to getting those kids in the kitchen too! No more picky eaters! Thank you for your kind words! Oh Renee, there is SO MUCH I love in this post. Thank you for taking the time to write it! I think it is so important to foster kids interest in the kitchen and connecting with food. I am thankful every day my Mom and Dad spent the time with us in the kitchen. Good stuff! Sharing with my cousins! I love the idea for this post. 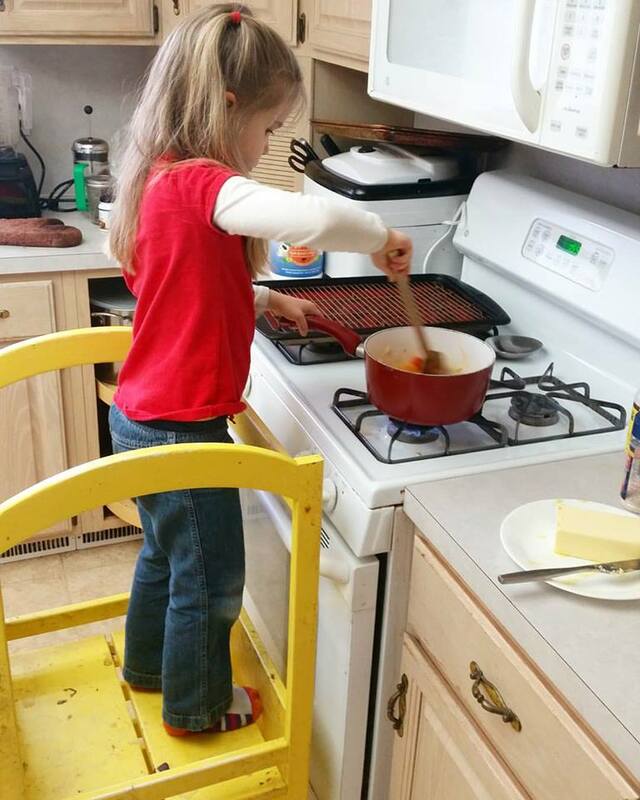 Getting kids to help in the kitchen is the best thing ever! Renee, they are absolutely adorable ! You are a wonderful momma and they are learning a great lot from you. So happy they gain so many wonderful skills while young. Such an important gift ! This is amazing!!!!!! Truly inspiring, your littler helpers are so independent and proud of themselves. You are a goddess and queen of patience… I’m going to get Jack more in the kitchen with me! Thnk you for all the tips! Thank you for your kind words Cristina! This is perfect timing! 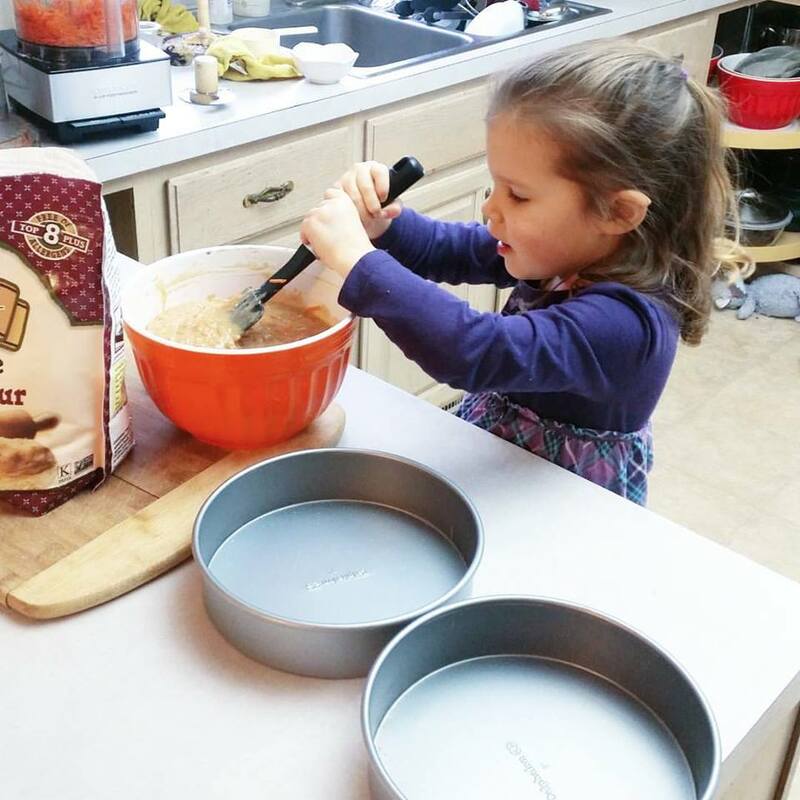 Your little ones are adorable and so helpful in the kitchen! Great tips. Renee – what a brilliant post! Sharing it as we all need to get this out there that kids being in the kitchen and off their devices is absolutely essential! In my day if I was watching tv whilst my Mum cooked I’d be in such trouble, now it’s where we will find most kids! I appreciate your kind words Donna! Thank you! I love each and everyone of these tips! I was scared to use a knife until I was 9 years old. 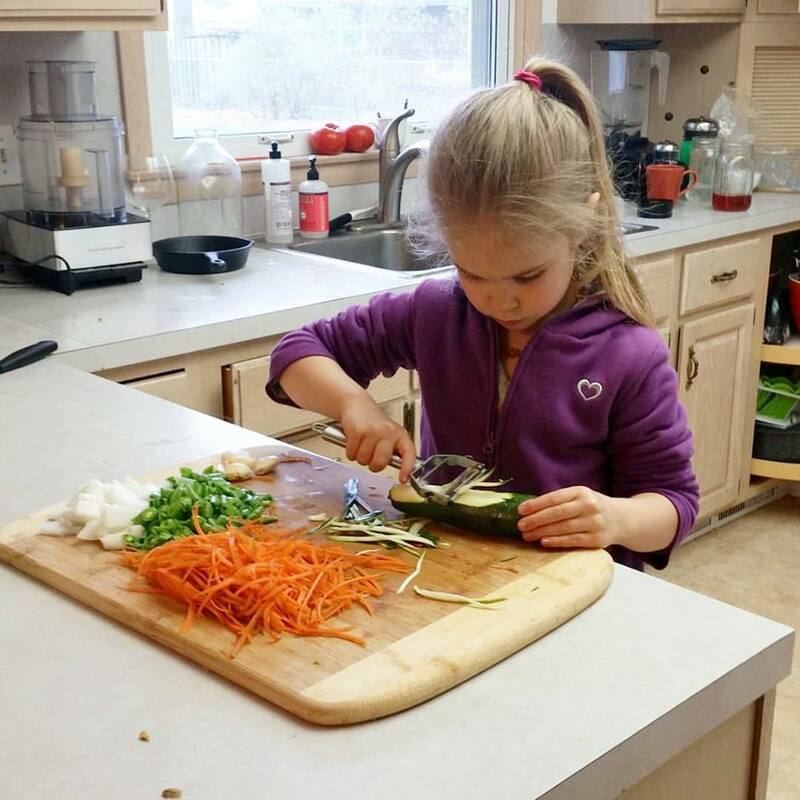 I think it is the best thing ever when moms teach their kids safe knife skills and other cooking skills from a young age. Thank you Katie! I was petrified of a knife as a kid too – and didn’t learn how to use one until I was in my 20’s!